This entry was posted on November 27, 2013 at 5:42 PM	and is filed under Training. 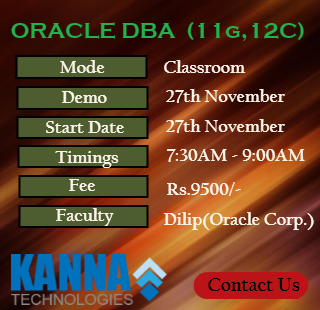 Tagged: dba training, dba training in kanna technologies, KANNA TECHNOLOGIES, kanna technologies training, oracle dba training in hyd, oracle dba training in hyderabad. You can follow any responses to this entry through the RSS 2.0 feed. You can leave a response, or trackback from your own site. hi sir may please tell me when oracle dba and apps dba new batch start. Can you please tell me when RAC 11g batach will start and is it possible on weekends ?